Who are we and what does The Corps do? The Corps of Commissionaires was founded in London 1859 by Sir Edward Walter KCB. The original aim was to provide to employment and welfare support for veterans of the Crimean War. 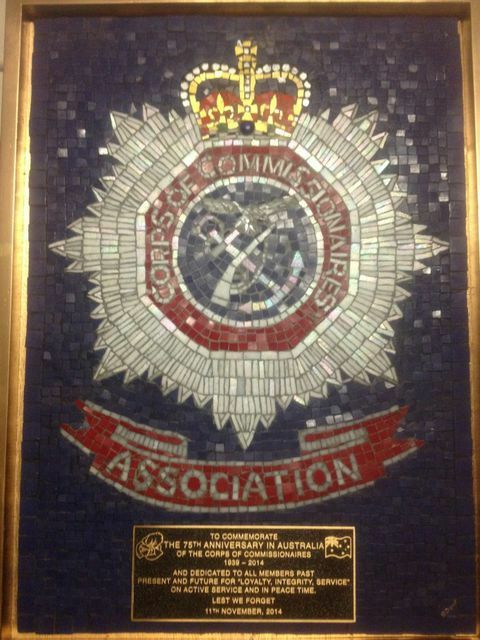 The Corps of Commissionaires was established in Australia in New South Wales in 1939 and became based in Victoria in 1946. There are Corps members in all states in Australia from all three Australian military services. Our members range from World War 2 veterans through all conflicts to Timor and Peacekeepers. The Corps is currently an ex-service, welfare and philanthropic organisation that is located at the Veterans Centre in the Heidelberg Repatriation Hospital, Victoria. Corps members serve as Custodians at the Shrine of Remembrance. The Corps has links with other ex-service organisations, Legacy, Sir Edward “Weary” Dunlop Foundation and cadet units throughout Australia. See links to Australian Veterans' Organisations and Cadet Units. The Corps' currently are involved with many veterans events such as Anzac Day and Vietnam Veterans Day each year and invite you to come and commemorate with us. See the Latest Newsletter for news and information about Upcoming Events.